Simplest Zucchini Parmesan Pasta. 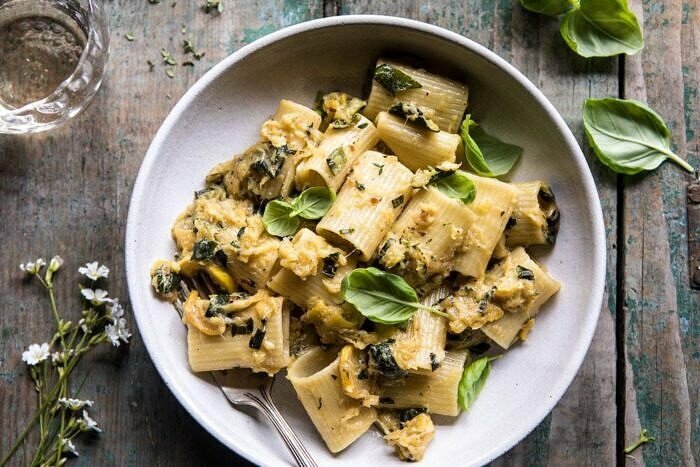 Two of summer’s star produce, zucchini and yellow summer squash are caramelized and mashed to create a creamy, buttery pasta sauce without using any cream. 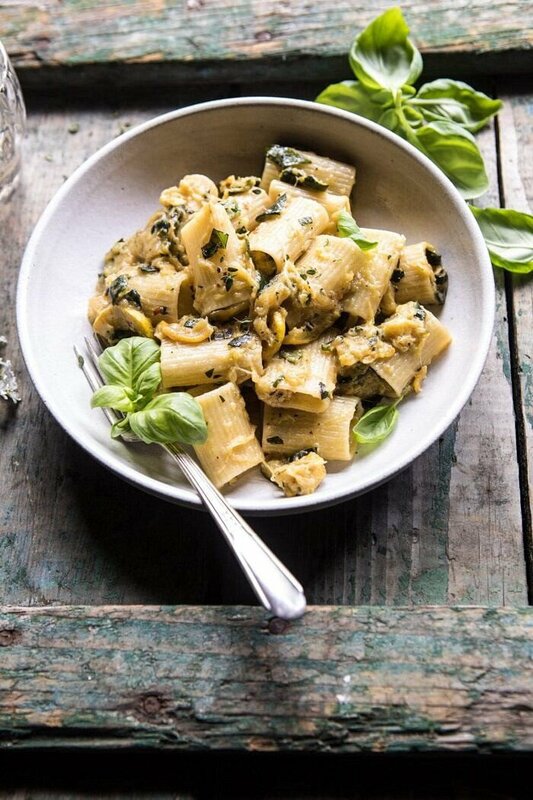 This pasta takes just minutes to make and uses the simplest of summertime ingredients, most of which you may have in your pantry right now! If you’re looking for a new pasta dinner, this is it. Bonus? This pasta is full of veggies, making it healthy…ish. Hey, hi and welcome to another addition of super simple Thursday here on HBH. I am loving getting creative with these easy recipes, making them delicious, pretty, and fun! This fresh zucchini pasta… It. Is. GOOD! I mean, it’s so simple, yet, so delicious and also very different. Why? Because I made the pasta sauce out of zucchini. No cream, no eggs, just a lots of zucchini, parmesan cheese, and fresh basil. OK. And maybe a little butter too, because I mean, pasta needs butter, if you ask me. Before I dive into the details, let me tell you where my inspiration for this recipe came from, Meghan Markle. Yes, Meghan Markle, as in the new Duchess of Sussex. If I’m being honest, I really did not follow any of the royal wedding, but it was hard not to miss some of the headlines as they were everywhere. A few things did catch my eye. One, her dress/dresses were all stunning. I loved them. What did you guys think? Two, I also loved her simple makeup look, proving to girls everywhere, that you don’t need to cover up your face. And also? Simple is best. So I did do my thing, and it turned out SO GOOD. Very excited about it. Thank you to the new Duchess of Sussex for inspiring today’s recipe. Let me explain how exactly you turn zucchini into a pasta sauce. For starters, you’ll need to boil some pasta, reserving the pasta cooking water to use for thinning out the zucchini sauce, this is key. I have mentioned this before, but the pasta cooking water is an essential ingredient to creating some of the best pasta sauces. Always reserve a little water before draining. Always. You can really use any cut of pasta you love, but I’m loving the large tubular shape that I used. The ridges really catch all the sauce so that each bite is perfectly saucy. While the pasta is cooking, start the zucchini. The secret is to cook the zucchini until it is deep golden and caramelized. Once it hits this stage, it can be easily broken down and mashed. Cooking the zucchini this way allows for the flavors to really come out, it becomes sweet and buttery. It’s honestly just magical. That sounds so cheesy, but I don’t know of a better way to say it. I decided to leave the zucchini on the chunkier side, but if you prefer a smooth pasta sauce, you can puree the zucchini in the food processor. Personally, that’s just another step that I didn’t want to do, but do what you like! Whether chunky or smooth, it’s going to be good. All that’s left to do is add the cheese, I like parmesan a lot, but manchego is really good too, if you happen to have that available. Stir in lots of fresh basil and that’s it. Pretty simple, right? Under ten ingredients, under thirty minutes, no fancy ingredients, but still really, really good. Love it! And when I say I love it, I really mean it. This is one of those recipes that can easily become a staple, because it truly is so easy, simple, and delicious. I like to think of it as a fancier version of buttered noodles with the addition of lots of zucchini, basil and parmesan. It’s truly perfection, and if you happen to be growing zucchini this summer, I foresee this becoming a staple in your kitchen too! 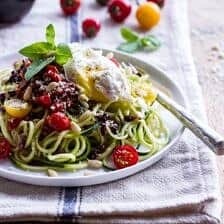 If you make this zucchini pasta, please be sure to leave a comment and/or give this recipe a rating! I love hearing from you guys and always do my best to respond to each and every one of you. 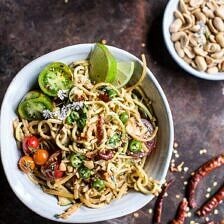 Oh, and of course, if you do make this easy, summery pasta, don’t forget to also tag me on Instagram so I can see! Looking through the photos of recipes you all have made is my favorite! Simplest Zucchini Parmesan PastaWEB from Half Baked Harvest on Vimeo. Two of summer's star produce, zucchini and yellow summer squash are caramelized and mashed to create a creamy, buttery pasta sauce without using any cream. 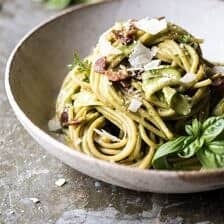 This pasta takes just minutes to make and uses the simplest of summertime ingredients, most of which you may have in your pantry right now! If you're looking for a new pasta dinner, this is it. Bonus? 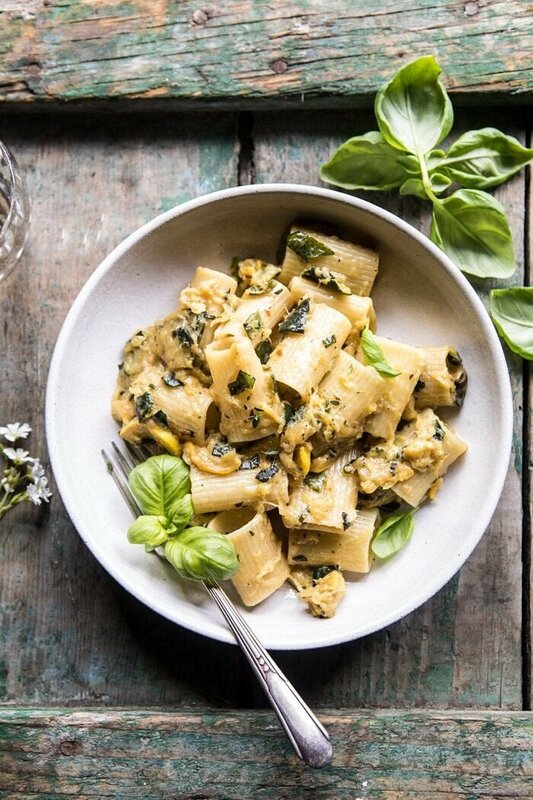 This pasta is full of veggies, making it healthy...ish. 2. Meanwhile, heat the olive oil in a large skillet over medium heat. 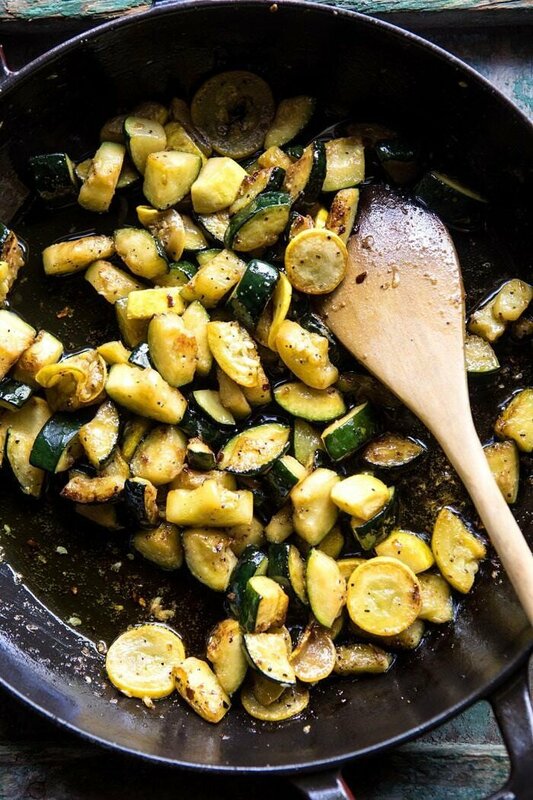 When the oil shimmers, add the zucchini, garlic, red pepper flakes, thyme, and season with salt and pepper. Cook, stirring occasionally until the squash is caramelized and golden brown, 5-8 minutes. Using a potato masher, mash down the zucchini until it becomes a chunky sauce. 3. Add 1/3 cup of reserved pasta water and bring to a simmer over medium heat. Add the pasta, butter and manchego, toss until melted. Add more pasta water if need to thin the sauce. Remove from the heat, add the basil. Transfer to a bowl and serve topped with fresh basil and lemon . Enjoy! 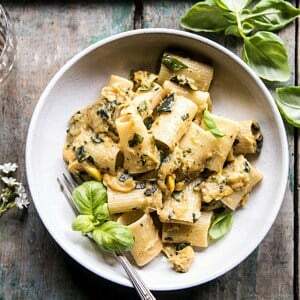 *If a smooth sauce is desired, transfer the zucchini to a food processor before adding the pasta and puree until smooth. Hey Teigan love your blog and recipes!!! They are a visual delight!! One comment – not sure if you know this or not but when A recipe calls for ‘salted water’ it’s best to bring the water to a boil and then add the salt. The reasoning being salt added before the water boils drops to the bottom of the pot wher it sits until it is able to dissolve thus aiding in the erosion of the surface of the pot. Just thought you might want to know. hey girl- this dish looks amazing! My Italian mother would frequently make this on Friday nights when we were supposed to be meatless. Delicious meal! Pure comfort food for me. Her dis was more liquidy. I will definitely try yours to compare. Thanks for posting the recipe! Thank you Rose! I hope you love this! Hi Deborah! I hope you absolutely love this recipe and works great for you! Please let me know how you like it! Thanks! I enjoyed reading this article. Meghan’s dresses were fantastic – I liked both of them as well. As for your pasta recipe. It sounds so, so delicious and your pictures are superb! LOVE! I hope you love this! Thank you Dominique! YES! Perfect recipe for my garden zucchini and basil! And all of the other ingredients I always have on hand. Thank you so much Brittany! I hope you love this! I saw this recipe this morning and knew I had to make it for dinner. When I asked my 14 yr old if it looked good she responded by saying, “If it’s Teigan’s, I’ll love it!” Thought you should know you have young fans in my house!! Thanks for another delicious recipe!! It will be a staple for us during zucchini season. Awh that is amazing! I am so happy to hear that Kathleen! Thank you! I thought you should know you have young fans in my house. Thanks for another awesome recipe. It will be a staple here during zucchini season. I love that you created this recipe! I read that same article about Megan Markles diet “favorites” and was inspired by her sauce to create my own version soon! So, thanks for the recipe! Sounds amazing! I am so glad you loved this Karen! This was wonderful! Can’t believe the consistency you can get from just zucchini! Love your blog and all of your recipes! Thank you so much Katie! I am so happy you loved this recipe! PS I was disappointed in Meghans’s dresses. Her wedding dress was ill-fitting and boring. But, it was her wedding not mine! Holy moly this was so delicious! Easy to make and full of flavor, will definitely be making it again! 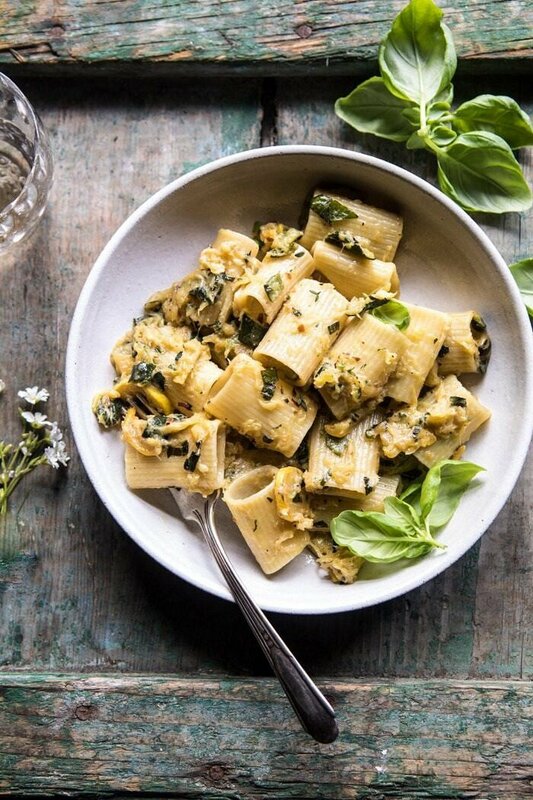 Yes please to a simple summer pasta! This is the perfect lunch or dinner any day of the week! I am always on the lookout for zucchini recipes. I will definitely this to the rotation. It looks delicious! Love this recipe. Delicious like all the recipes on this site! Added a ball of mozzarella just because I had one sitting in the refrigerator and I think it was a nice addition. So good! Made this for my husband who was a bit skeptical but he loved it. He even ate it cold for a second night dinner. Great recipe and not too difficult or fussy to make after a long day of work. That is so amazing! Thank you Sandy! I am so glad you loved this Torrey! Thank you! I’ve eaten this at least 4 nights this week. So tasty and simple to make! I made this last evening; absolutely delicious! I followed your instructions, keeping the pasta water and adding it when I felt necessary but my freshly grated Parmesan cheese clumped up in spots. Of course, biting into big creamy clumps of fresh Parmesan isn’t a problem for me but you know… Anyway, what do you think went wrong? Thank you for responding and more importantly, thank you for sharing this awesome recipe. It has been pinned and will be made again. I’ve made a recipe similar to this for years and always loved it. I followed this recipe and I’m not sure I am a fan of the mashed zucchini sauce. Maybe I didn’t cook it right, but I’d probably just keep the zucchini diced and not mashed. Just my preference! Hi Cristina! I am sorry you did not enjoy this as much as you expected! I hope you try it with your preference of zucchini cut and love it! Could you use garlic infused olive oil instead of the garlic? Also, what meat would you recommend to add to the pasta? 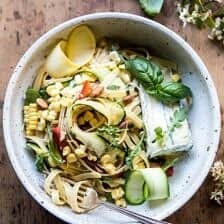 Fantastic pasta dish and a great way to use the abundance of zucchini during a warm Kelowna summer. Note, I used two tablespoons of good quality pesto in lieu of fresh basil and it turned out perfectly! I am Italian and have had so many different pastas. I love them all. 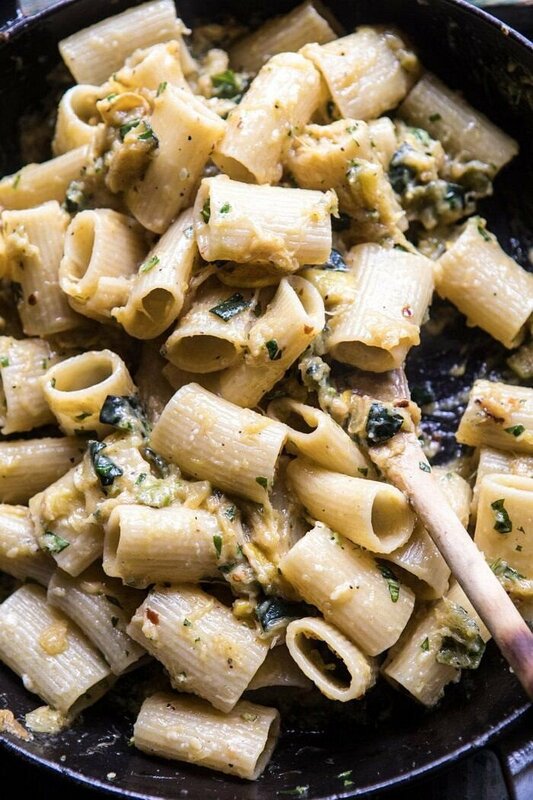 But this one….it might be my favorite pasta dish EVER! It was easy to make, had just the right amount of spice and was so full of flavor! I topped it off with some fresh lemon and a little extra parm….oh my word!!! It’s pasta heaven!!! Ah I am so happy to hear that! Thank you Tina, I am so glad you loved this recipe! This is one of my FAVE recipes right now! My boyfriend and I make it at least once a week. We have zucchini in our garden and this is a great way to use it up. We’ve also been adding an eggplant or two (we’re also inundated with those right now too). SOO GOOD! and I forget to take a pics every time. I am so glad you are loving this recipe Chelsea! Thank you so much! Thank you so much Karen! I am so glad you loved this! Long-time follower of your blog and first-time commenter here! I just had to take a few moments to thank you for this particular recipe—I had read the same article about Meghan Markle and her favourite pasta dish and knew I wanted to make something like it for the Labour Day dinner I was hosting today; I thought it would be a great way to showcase the last of our summer bounty (soooo many zucchini) and I was so pleased to find your version! I made it just as your recipe directed choosing parmigiano-reggiano cheese and it was a HUGE hit! Two pounds’ worth of pasta disappeared within 30 minutes. Served alongside your garlic & herb roasted cherry tomato pizza with caramelized onions (which was also devoured in a flash) the dinner was a great way to bid farewell to summer and beckon in autumn. Thank you for being a part of our family dinner and I look forward to choosing something from your roster for Canadian Thanksgiving! Sounds so amazing! I am so glad you loved this and other recipes of mine Sabrina! Thank you! Making this again and again for the busy nights! We didn’t have a great masher for the zucchini so we just threw it into a blender and it tasted great! That is so awesome! I am so glad you loved this Melanie! Thank you! Absolutely delicious! I added some spinach after crushing the squash just to add another veggie. Amazing! I am so glad you loved this and it turned out so well for you, Katherine! Thank you! I’ve been looking for ways to get my 3.5 year old to eat more veggies. He helped make this dish and liked it (as did my husband and I)! I quickly pureed the zucchini to help disguise the more obvious “greenness” but left it slightly chunky and my son still ate it up. Thanks for another delicious meal! Thank you so much Christine! I am so glad you loved this!